The new S 38 SX is a first of its kind, with a 5-section boom never seen before. 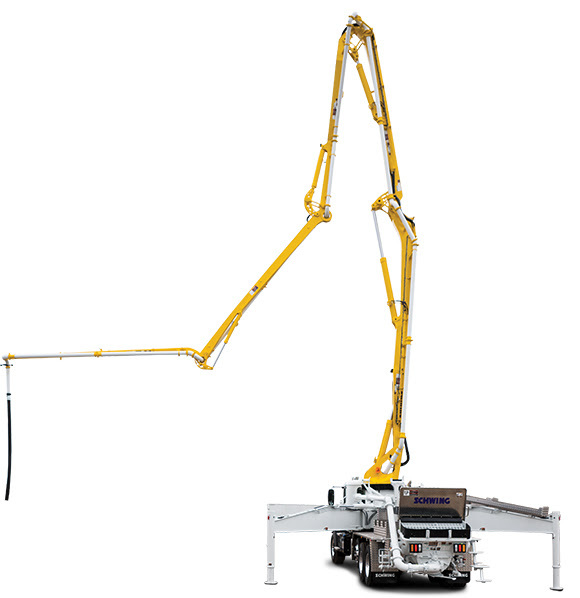 This is destined to be the most popular boom in our line-up with job forward articulation that hyper extends at every section to exceed the capabilities of traditional Z and Roll and Fold Booms. Combine this boom’s versatility with an extremely small footprint (22’10” front outrigger spread) and EASy one-sided outrigger system to go anywhere and pump any project. Two models will be on display– a cab over three-axle unit in the Mack booth (C5103) and a conventional cab four-axle unit that meets the Federal Bridge Formula in the Schwing booth (C5142). Come and see which model will work best for your market.